Guess what? I measured one of my top bar hives. Eveything is made from rough cut 1 by 10s. Remember that bees just need a hollow space and dimensions are not important, though this size has proven versatile. To generally keep combs straight on the top bars, they are cut at 1.25” width. This is just the general trend, and NOTHING IS ABSOLUTE WITH BEES. Angle of sides: 120 degrees, gap left at bottom of board makes the side 10.5"
A .25” by 20” strip separates the divider boards from the first and last top bars and maintain bee space. I sit the side boards angled onto the bottom to create bottom entrances. See some pictures. Get creative. The box is 3 feet long, for convenience. 4 feet would give them even more room. A LETTER FROM DEAN STIGLITZ. I’m sending this email out to individuals and organizations who might have interest in the fall application of imidacloprid by APHIS in Worcester County. My wife and I are beekeepers in Worcester County. Our colonies are outside of the current treatment zone, but not far away. I wouldn’t be surprised if the zone extended to some of our hives either in New Braintree or in Leominster. I should also add the disclaimer that I am not a beekeeper who believes that imidacloprid is the cause of recent well publicized honeybee die offs. Imidacloprid does kill bees in isolated incidents, some of these are well documented, and there is no question that it is extremely toxic to bees if they encounter it. The issue with the ALB treatment is unique. My wife and I attended the initial public meeting in Worcester when the ALB was first spotted. I participated in the forum, and made important contacts at APHIS, notably, Bob Baca, whose job is environmental compliance. I made the first suggestions, and did extensive follow up to have APHIS fund a monitoring program for bees in and outside of the treated area. I put Bob Baca in touch with Ken Warchol, our county bee inspector who is working with Jeff Pettis (of the USDA Beltsville Bee lab), a graduate student, and our state apiarist, Al Carl, on this study (I believe they have setup 25 hives within the treatment zone, and 25 outside). I maintain that if APHIS does what they plan to do, that this study is imperative. Our last field day of the season! All day Saturday, September 26, is the Germantown Community Farm Fall Party. Beekeeping field demos and many other fantastic workshops will be part of this family-fun skill-share weekend. Learn all day, eat great food, dance all night! This is my favorite party, and this year it happens on the day we salute Johnny Appleseed. This event is open to everyone, with donations accepted to help cover costs. Childcare provided. My bee talk will commence at 2 PMish. Wild hive removed in south Florida 2/19/09. Sweet Africanized Bees! Photo by Rob. I talked and talked about bees to a computer for a while in February, and some of the biobees folks in the UK were out there listening! I have been in the desert. Tearing through the Arizona canyons, from bee yard to bee yard. 100 mph in the back of Dee Lusby's '86 GMC. Dee, the small cell guru who has inspired thousands to stop doping their beehives, had not been out to check her hives since October. We figured her losses at 3%. Better still, the spring buildup is on, with drones already emerging and the main flow not commencing for another eight weeks. Meanwhile, I hear that in southeastern states formic acid is not keeping mites under the suggested "threshold" and beekeepers are continuing to resort to even nastier means. The result is nastier mites and dead microbes. Not much help for the bees, who are the keystone of the diversity of our planet. 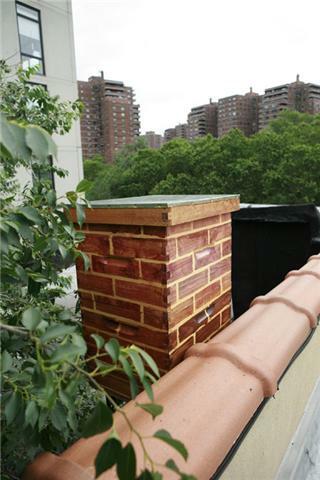 If the hives are not safe, neither are we. The honey on the store shelves is tainted. The commercial beekeeping industry, our industrialized food production, our entire worldview are all in for serious change. I'm ready. More importantly, the bees are ready. 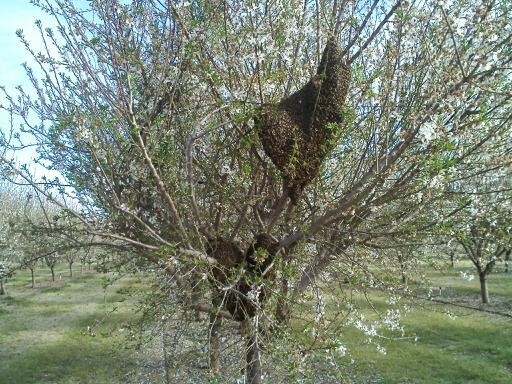 It's spring: do you know where your bees are? This is it! Spring time is the most important time, like breakfast as they say. And I've still got bees. Lots of bees. Content in their boxes unlike the Californian pollinators above. The Anarchy Apiaries Almanac is now available - send me $5 for shipping, or just come see me and the bees in NY for a free copy (highly recommended). 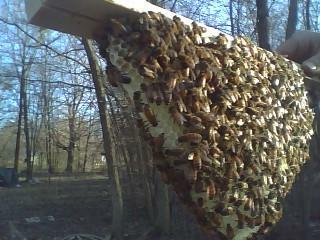 I am sold out of hives for this year! 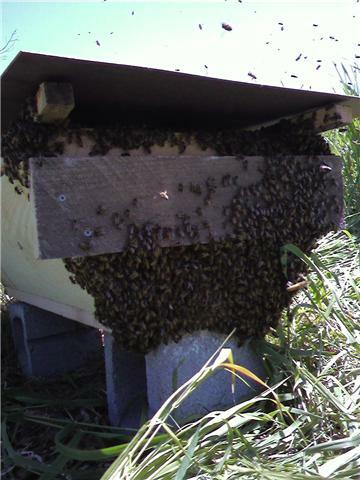 Queen bees are available - please call as early as possible. 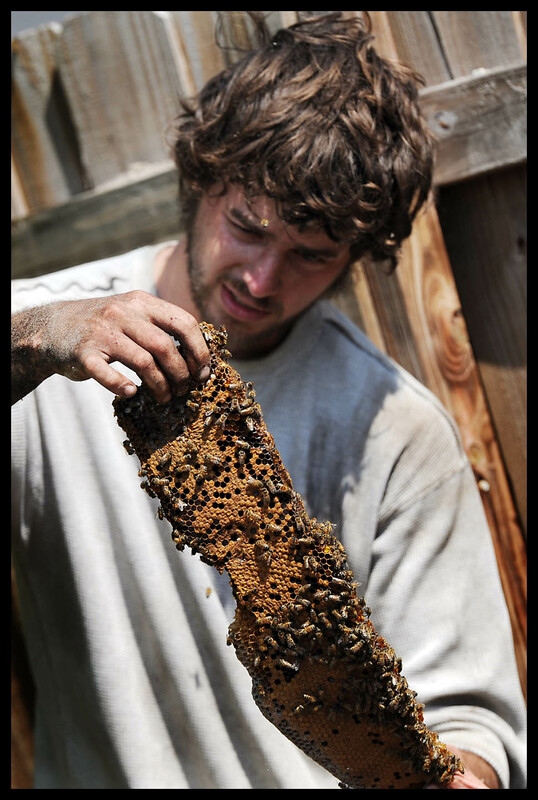 The Beekeepers Association of Northern Dutchess (B.A.N.D.) had another momentous meeting in January. The theme was "Get your hives ordered. Get your equipment built." We will recommence with field workshops in May.